This article is about the type of boat. For the food, see Pirog. For the Senegalese film, see The Pirogue. 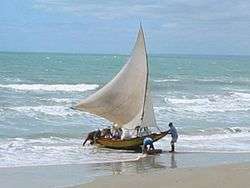 A pirogue (or piragua or piraga) can be one of several kinds of small boats. One kind is associated particularly with the Cajuns of the Louisiana marsh. The early Cajun pirogues were cypress dugouts but today they are usually flat-bottomed boats. Pirogues are not usually intended for overnight travel but are light and small enough to be easily taken onto land. The design also allows the pirogue to move through the very shallow water of marshes and be easily turned over to drain any water that may get into the boat. A pirogue has "hard chines" which means that instead of a smooth curve from the gunwales to the keel, there is often a flat bottom which meets the plane of the side. The pirogue is usually propelled by paddles that have one blade (as opposed to a kayak paddle, which has two). It can also be punted with a push pole in shallow water. Small sails can also be employed. Outboard motors are increasingly being used in many regions. 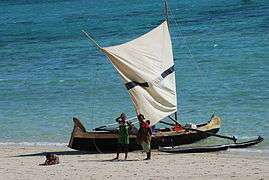 In West Africa they were used as traditional fishing boats. 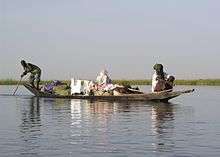 A pirogue on the Niger River in Mali. The word comes from the Spanish word piragua [piˈɾaɣwa], which comes from the Carib "piraua." Traditionally, it was just another name for dugout canoes, but it came to refer to a specific type of canoe. Naturally, in Louisiana the boats were constructed of cypress, but suitable natural lumber is no longer readily available. Plywood is the common material for modern pirogues. Many modern duck hunters and fisherman in the swamps of south Louisiana use pirogues made of fiberglass, some of which are outfitted with small outboard motors or trolling motors. In his 1952 classic song "Jambalaya", Hank Williams refers to the pirogue in the line "me gotta go pole the pirogue down the bayou". Johnny Horton, an avid Louisiana fisherman who celebrated Cajun customs and culture, also mentions pirogues in his 1956 song "I Got a Hole in My Pirogue." Hank Williams, Jr. (son of country music legend Hank Williams) had a hit song in 1969, "Cajun Baby", which refers to the pirogue in the line "ride around in my old pirogue". Doug Kershaw's 1961 hit "Louisiana Man" includes the line "..he jumps in his pirogue headed down the bayou". Many online lyrics sites mis-understand this line, saying 'hero' or sometimes 'biro' instead. On the Lewis and Clark expedition, pirogues were among the boats used during the journey. The term usually referred to the medium-sized boats of the company carrying eight rowers and a pilot, capable of carrying eight tons of cargo. Henry D. Thoreau writes of using heavy pirogues in his book "The Maine Woods". Lewis and Clark's pirogues mounted blunderbuss to the bow with a pintle. In 626, when the Avars were besieging Constantinople, the Slavs crossed the Golden Horn in their pirogues and landed on the shore of the Lower Blachernae, and in spite of all defensive measures that were taken, looted churches. There are accounts of 17th and 18th century Caribbean pirates using pirogues to attack and take-by-force much larger vessels including sloops and even barca-longas. Pirogues were used extensively by pirates and buccaneers throughout the Caribbean, the now-Mexican and Gulf Coasts and the East Coast of what is now the United States. For the most part, though, such vessels were used for scouting or as tenders. Pirogues were used by Lewis and Clark on the Missouri River and westward from 1804–1806, in addition to bateaux, larger flat-bottomed boats that could only be used in large rivers. There is not one pirogue design, but several. Besides small pirogues as seen above, there are also pirogues that can hold up to ten men with paddles and also feature a main sail. These too, however, are not designed for open waters. They are best used near shore. ↑ Dirimtekin, Feridun (1956) Fetihden Once Halic Surlari. Istanbul, Istanbul Enstitusu. 1 2 Marley, David F. (2010). Pirates of the Americas, Volume 1. ABC-CLIO.